Who is worthy to replace Michael Schumacher's place as Ferrari's no.1 driver? Alonso or Raikonnen? Kimi is just the man for me! :) What's your opinion? both alonso and kimi r good drivers, but not as good as schumi. this season wud be a good one with a number of contenders for the championship. 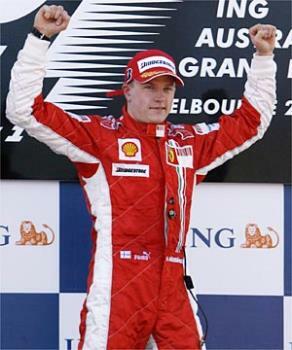 but i personally think kimi has a slight edge over alonso and now with a ferrari under him wud make a lot of difference. I don't like alonso to replace schumacher! Beside Raikonen,i think Hamilton is very suitable to replace The Legend Schumacher! Kimi, the best talent. Alonso the consistent man. This year it will be between these two. When the season ends, there will be no place for Hamilton in the top two. In terms of temperament during the race and talent, Kimi seems to be better than his team-mate Massa, but Massa scores higher when it comes to team spirit and discipline. While Massa believes in working hard even while not racing, Kimi is known for his wild-parties and boozing. He hardly ever spends time with the technicians for fine-tuning the car or testing new and underdevelopment parts. He believes that he is too good to be a test driver. Michael Schumacher was known for his dedication and inputs to the testing and development teams and is widely credited to be the man who made Ferrari the professional unit they are, along with Ross Brawn. Massa has been a good pupil of Michael and so seems to be best replacement for him at the moment. He has not had too much of race winning experience (he has won four times, two of which have come this year), but he is improving by leaps and bounds. Just the fact that he is consistently outperforming Kimi both in qualifying and races is testimony to the fact. Go Massa! May the force be with you! Yeah its only one problem its massa and kimi and i think they should be at an equal level. FORZA KIMI FORZA FERRARI... Flying Finn all the wayyy...! I do prefer Alonso.... We'll see what Kimi will do anyway... Good luck to him!